"629. 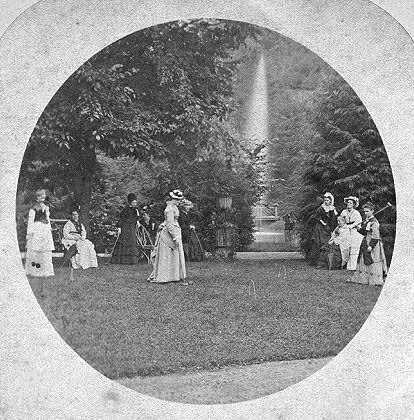 - View on Lawn, Glen Iris, Portage, N.Y."
This delightful view shows a group of women relaxing with a game of croquet on the lawn of the Glen Iris. Mr. Letchworth's pond and fountain can be seen in the background. We now know, thanks to the Park's history staff, that these young ladies were part of the Howland College Class of 1874. For more information, see Image 144. They are also found in Images 33 and 172.